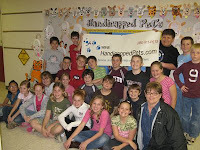 Members of Ms. Barton's 4th grade class have joined up with Marvin, from the RISPCA, to provide disabled pets a second chance. Ms. Barton's classes have raised funds through fundraising events to assist blind dogs, pets with cancer, and pets that need special equipment to get around, such as dog carts, special harnesses and slings. These students are to be commended for their compassion in helping those who cannot help themselves. P.S. A big Bow Wow from Marvin to all of you! Keep clicking to vote every day from January 10, 2011 until March 20, 2011.